Abstract: The fundamental unit of all interaction is issuing commands, and the trickiest types of commands are those that control “modes” — different ways to map the same input to different application actions. For example, the current mode in a tablet drawing app could determine if the exact same sequence of touch movements draws a line, pans the canvas, makes a marquee selection, or issues a gestural command. Switching between modes like these are frequent, so finding optimum mode-switching methods is important. In this talk, I survey my group’s work to understand and improve mode-switching and command selection for different input types and device form factors. These include: Pin-and-Cross, a touch overloading technique combining static touches with nearby crossing selection; Conté, a pen-like input device that leverages small changes in contact geometry; Doppio, a reconfigurable two-faced smartwatch for tangible input; and Gunslinger, a mid-air interaction technique using bare hand postures and gestures performed in a relaxed arms-down position. 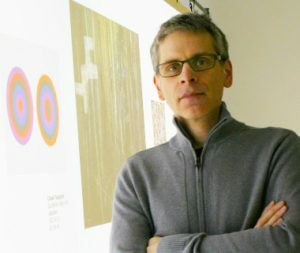 Bio: Daniel Vogel is an Assistant Professor and co-director of the Human-Computer Interaction Lab in the Cheriton School of Computer Science at the University of Waterloo. 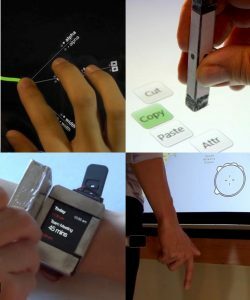 His research interests are fundamental characteristics of input and novel forms of interaction for current and future computing form factors like touch, tangibles, large displays, mid-air gestures, and whole-body input. In addition to earning PhD and MSc degrees from the University of Toronto, Dan holds a BFA from the Emily Carr University of Art + Design, and he leverages his combined art and science background in his research. For example, he was recently awarded a major grant to build a $1.8 million lab to explore the intersection of HCI and Fine Art in spatial augmented reality. Dan’s 2004 paper on interactive ambient displays is one of the ten most cited papers in the nineteen-year history of ACM UIST, and he has received honours including: multiple best paper awards at ACM CHI; the Bill Buxton Dissertation Award (2010); a Banting Postdoctoral Fellowship (2011 – 2013), and an Ontario Early Researcher Award (2017).